Also known as the ‘Barberry’ Berberis is a tough plant that deserves a little more attention from landscapers. And with over 400 species in the genus choice may seem great, although only a few of the better species are widely offered as garden plants. In general it is the Berberis thunbergii cultivars that are most widely offered by wholesale nurseries. A very useful plant in hard to deal with places, with foliage that it really stands out. B. thunbergii and its cultivars provide a variety of foliage colour and growth habit, including some upright forms being available. 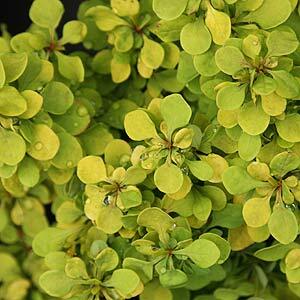 Foliage colours vary from the brilliant yellow of B. thunbergii ‘Dwarf Gold’, low growing with foliage that is bright and adds contrast to the garden. B. thunbergii ‘ Golden Ring’ actually has bright red to,purple foliage with a slight yellow on the leaf margins. The upright form B. thunbergii ‘Helmond Pillar’ has deep red foliage with a strongly upright or columnar growth habit, excellent for narrow spaces and smaller gardens. These are a deciduous shrub that do have thorns. Purple, Green and Golden Lime Green foliage varieties are all available from selected wholesale growers. They make excellent border plants, low hedges and are very easily pruned to shape. Most will reach around 2m in height and the popular cultivars are those with the colourful purple foliage. They grow well in just about any well drained soil in full sun. A ‘Go To’ plant for commercial landscaping in difficult areas. The flowers of some species were traditionally used to make yellow dye.